Many online examinations conducted by coaching classes, institutions, government exam bodies contain column matching questions. Answer choices for such questions are laid out in a grid-like format, as shown below in the sample page from a demo online test. 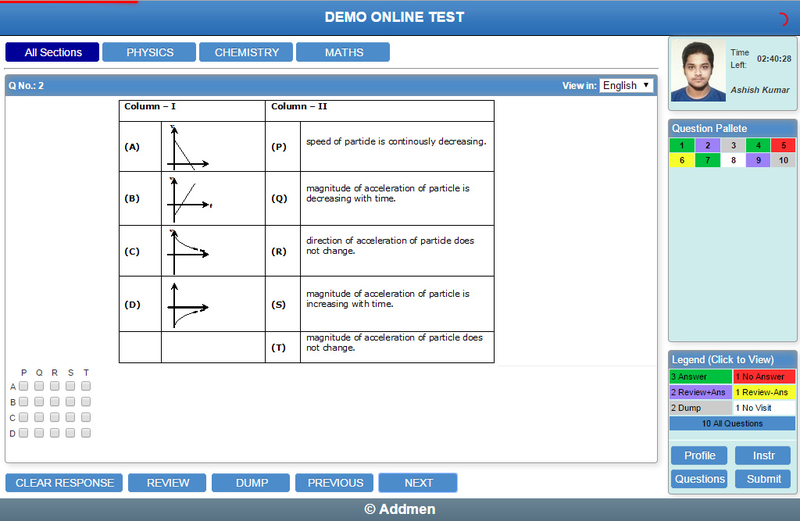 Addmen exam management software accommodates many types of questions, including these matrix style questions. You can set more number of answer choices than the number of questions in one question grid. Matrix style questions can be created using geometric shapes, chemical molecular structures, anatomical diagrams and complex mathematical formulae. Matrix style questions can be entered in specific formats in predefined Word templates that you get with the software. Matrix type question options are shown as per the image below, with A,B,C,D as rows P,Q,R,S as columns; this matrix can be 4x4, 4x5, 5x5, etc.